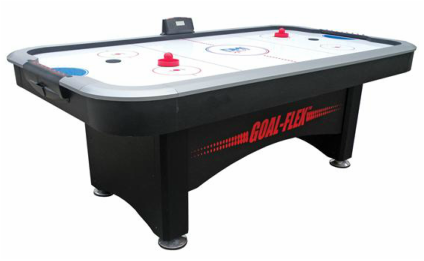 The American Legend Power Play 7' Air Hockey Table will finish off your game room in style and offer hours of entertainment with a 3/4" playfield, electronic scoring and patented Goal Flex Technology that allows players to electronically adjust the size of their goal for varying skill levels. Features 1/2" rails and a 4 3/4" leg leveler to accommodate a variety of surfaces. 3/4" playfield with playing surface dimensions of 77" x 40"